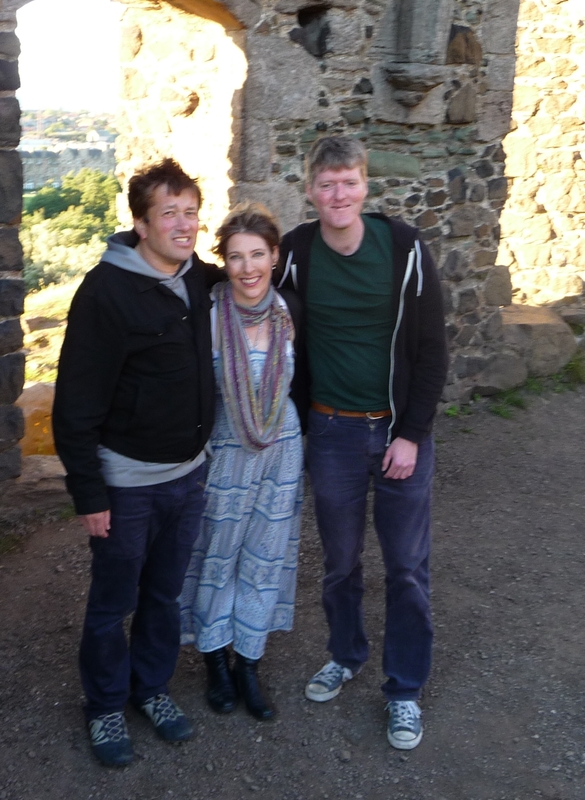 This was part of the ‘Wells of Arthur’s Seat’ project (which ends on Sunday). We began the evening at my studio with cocktails (invented for this special occasion – Chartreuse, vodka, fresh lime and syrup of Sweet Cicely over crushed ice, titled an ‘Arthur’s Sprite’ by my friend Donald!). Dominic and Riley Briggs treated us all to a live acoustic set – which was melodious, full of invention and fun as always. 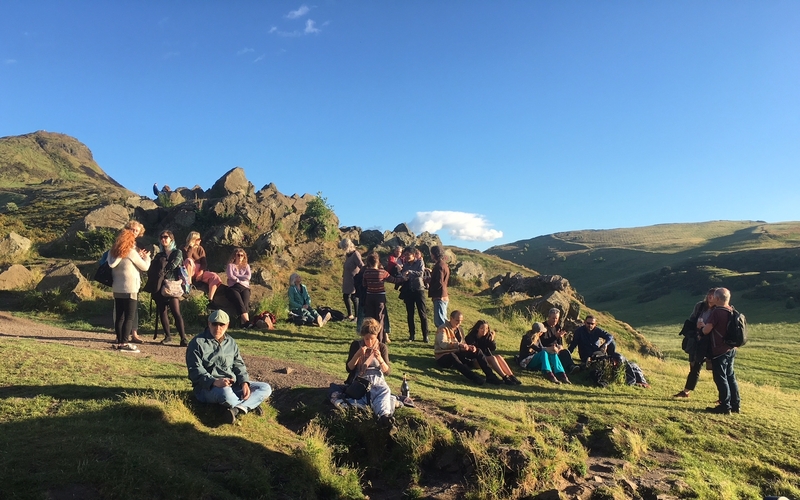 I think this may be one of my favourite gigs – being a bit high on ‘Arthur’s Sprite’ cocktails – music, sunshine, the atmosphere and conviviality. What a special evening, as Dominic said ‘this isn’t one we’ll forget’. My warm thanks to Dominic and Riley. 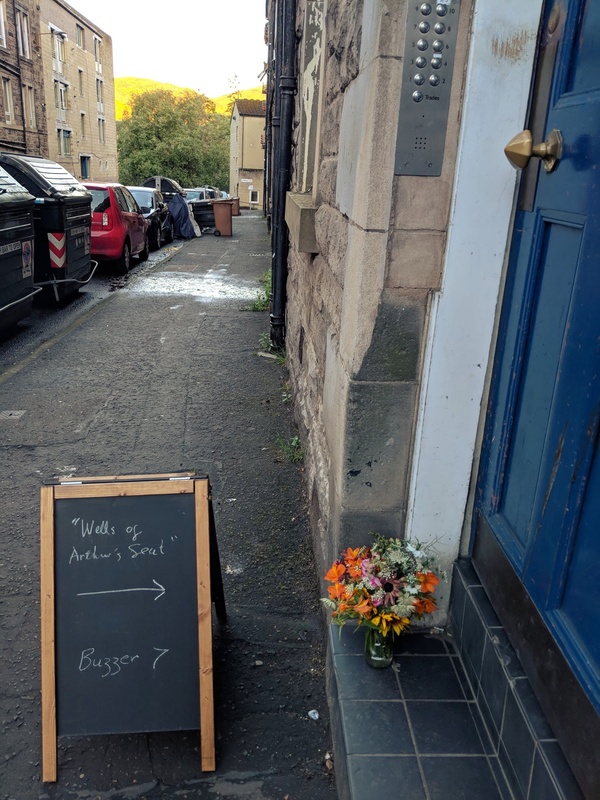 This entry was posted in Uncategorized and tagged Arthur's Seat, Dominic Waxing Lyrical, Riley Briggs Aberfeldy, rose strang, St Anthony's Chapel, Wells of Arthur's Seat on June 22, 2018 by rosestrang. 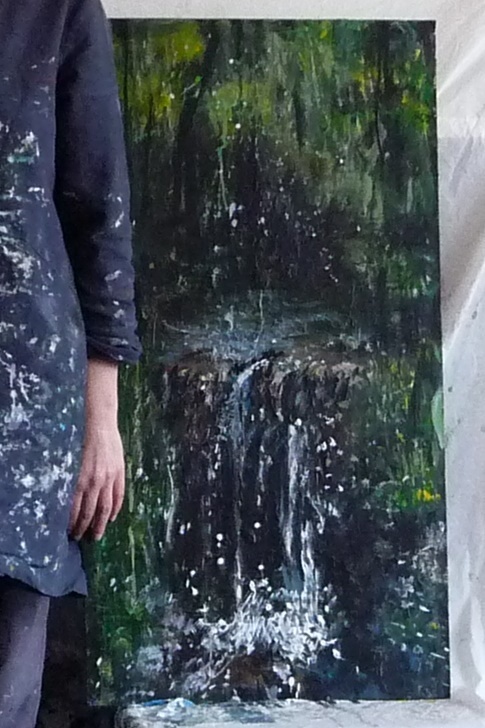 Two more paintings today, for the Wells of Arthur’s Seat exhibition, which launches this Saturday (all details Here). 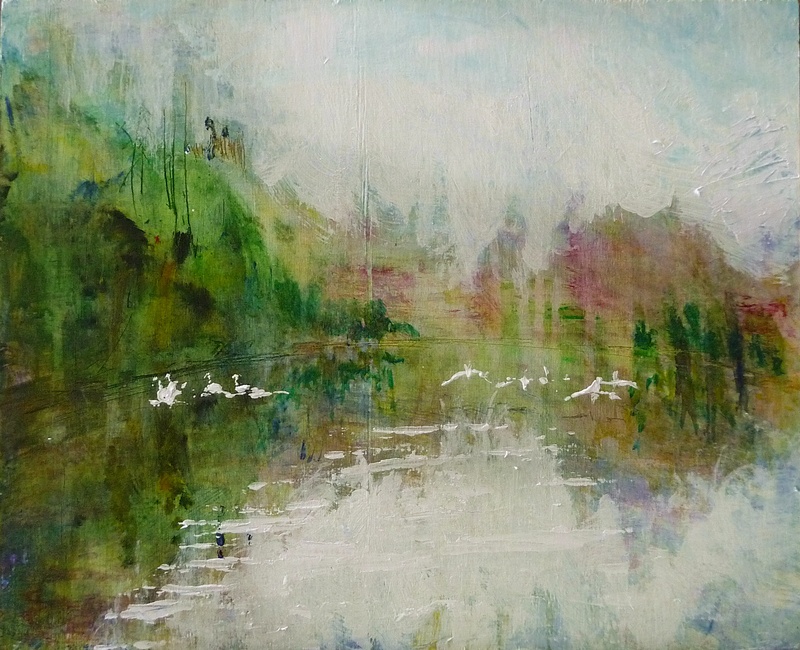 I couldn’t resist painting this view of St Margaret’s Loch with swans, having spent the weekend sitting there with friends watching them take off then fly down across the water. For this second painting of At Anthony’s Chapel I splodged primary colours directly onto the wood, the colours at sunset are so vivid it’s the only way to capture it. 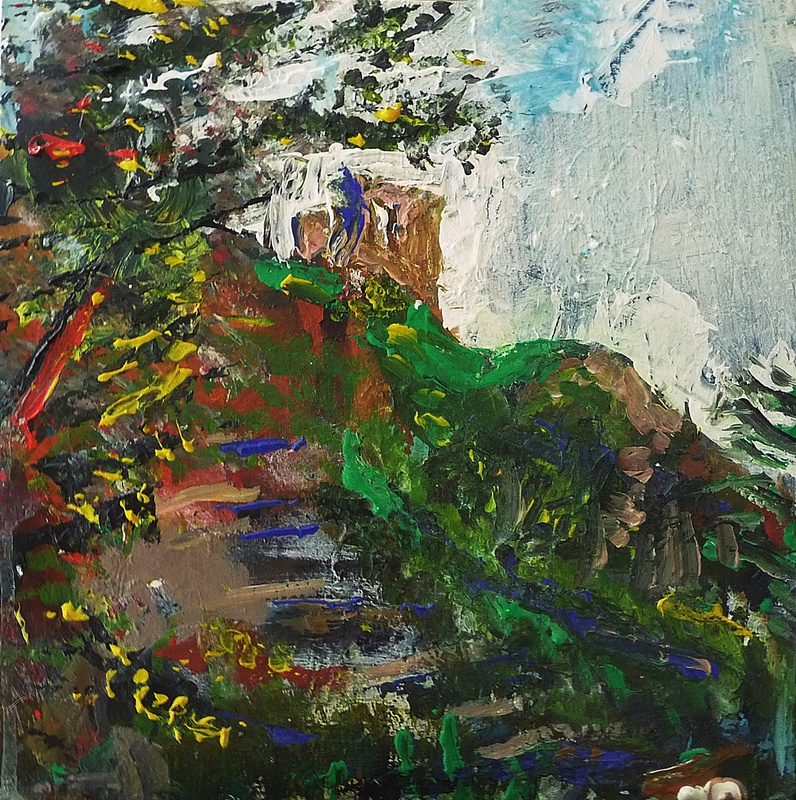 This entry was posted in Uncategorized and tagged Arthur's Seat, paintings of arthur's seat, Scottish artists, Scottish landscape painting, St Anthony's Chapel, St Margaret's Loch on June 12, 2018 by rosestrang. Sold. 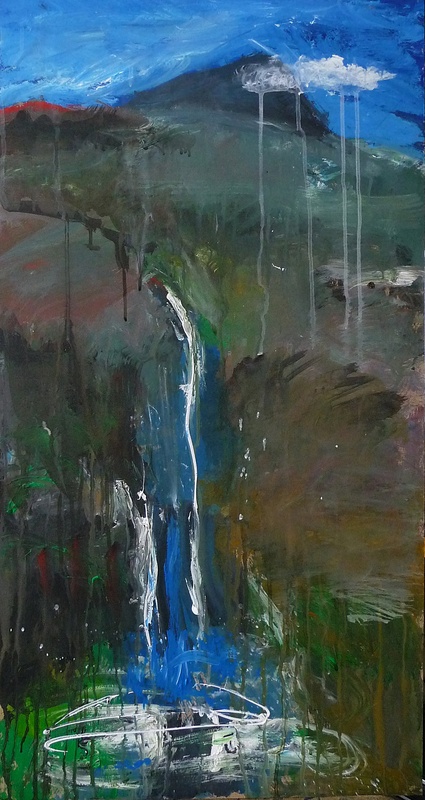 ‘Wells of Arthur’s Seat, Waterfall I’ Mixed media on 35 x 18.5 inch wood panel. Rose Strang 2018. 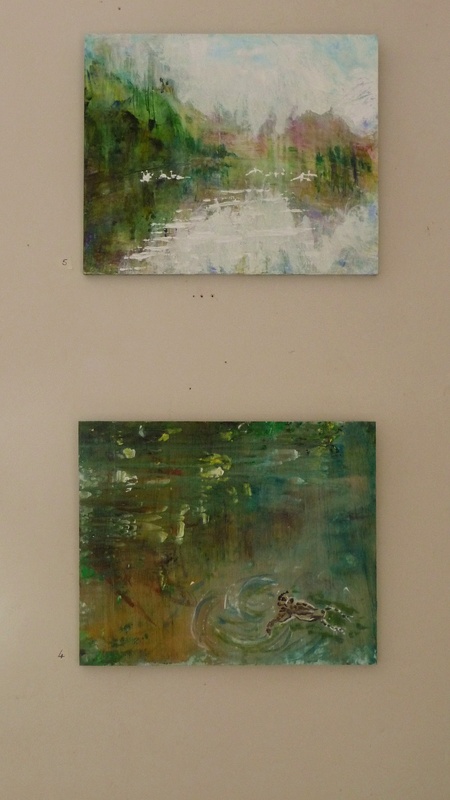 If you have any queries about these paintings, or would like to buy one in advance of the exhibition, contact me at rose.strang@gmail.com. (If paintings are bought prior to exhibition a red-dot sticker to denote ‘sold’ is placed next to the painting, which will then be posted one day after the exhibition ends – 25th June). 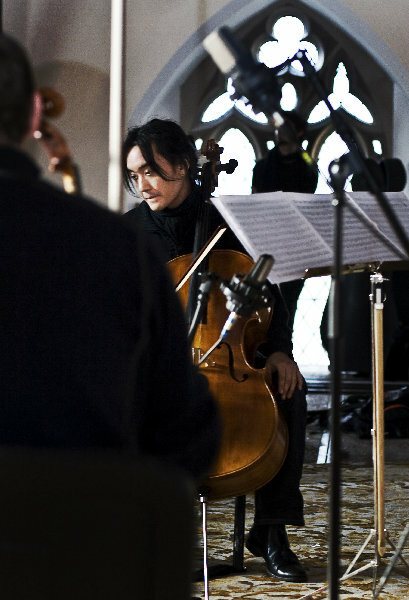 I’m delighted and honoured to be collaborating with two very talented people on this project; the poet Alan Spence and cellist/composer Atzi Muramatsu. 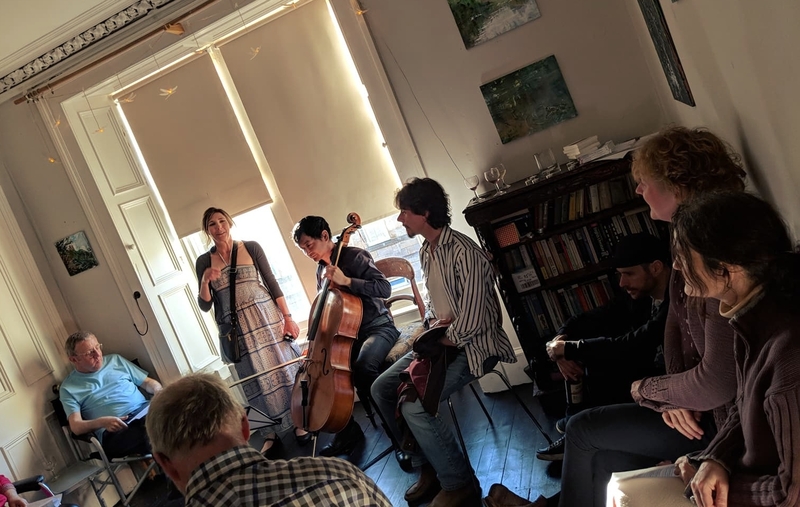 Their reading and performance will premiere at the Private View on the 16th June, but will be viewable on subsequent exhibition days on video (we hope to develop the project further and there may be subsequent live performances). 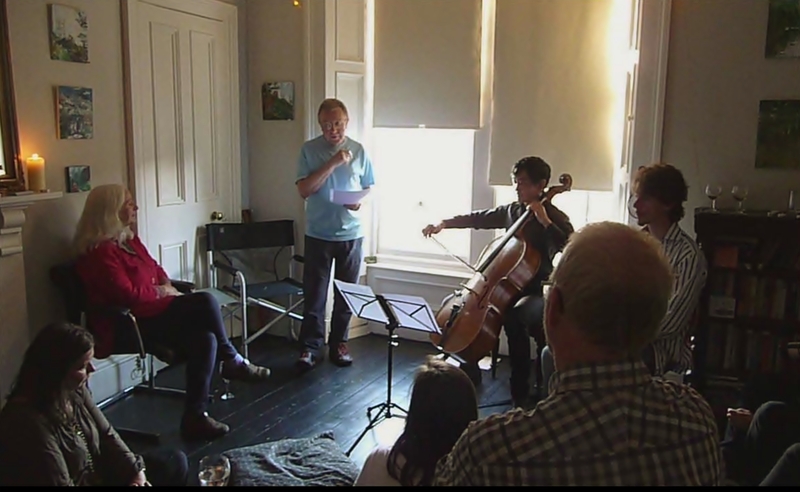 There are also Open Studio days, where the paintings can be viewed, and a video-showing of the poetry reading and performance of poet Alan Spence and cellist/composer Atzi Muramatsu from the private view event. 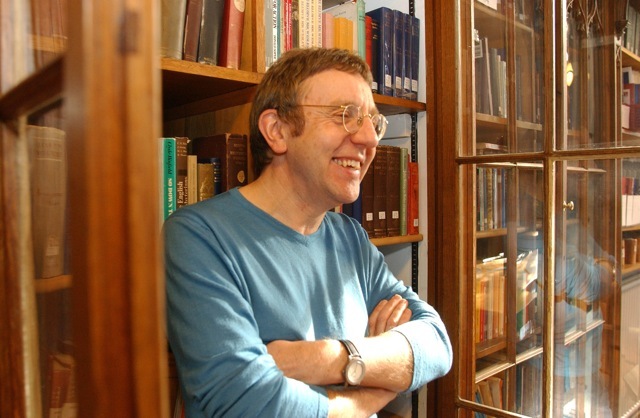 Alan Spence was named Edinburgh’s Makar in 2016 (Makar is the Scots word for learned poet). His work has, for many years, explored Japanese culture and spirituality including Zen traditions and Haiku poetry. In recognition of this Alan was recently awarded the Decoration of the Order of the Rising Sun by the Government of Japan). This is the first time I’ve collaborated with Alan, and I very much look forward to experiencing the poetry he’ll create for this project. 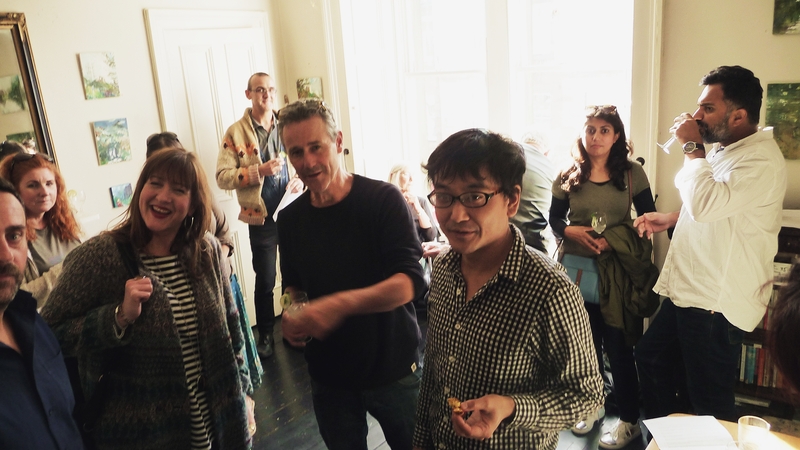 Atzi Muramatsu has been (amusingly) described as ‘the Scottish Central Belt’s most well-known celllist’, this is not least because he is an avid and dedicated collaborator, with artists, dancers, other musicians and writers across Scotland and beyond. 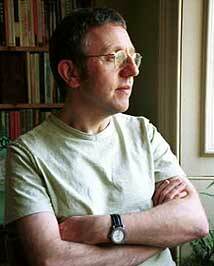 He also writes film-scores and in 2016 was awarded a Scottish BAFTA for Best Composer New Talent. It’s absolutely a pleasure to continue our long-lasting collaboration. 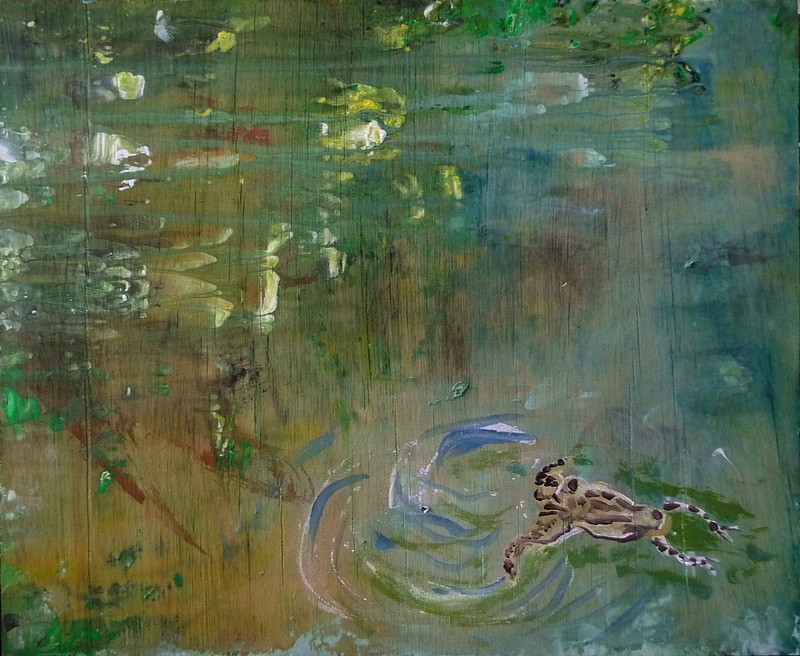 *please note – as we are not receiving public funding for this project, a performance and project fee is paid to Alan and Atzi from the profits of painting sales. We hope to develop the project further and there may be subsequent public funding, resulting in additional performances and developed professional video of the project. This series is inspired by the landscape and local history of Arthur’s Seat – the hill in Edinburgh that sits to the south of the city. 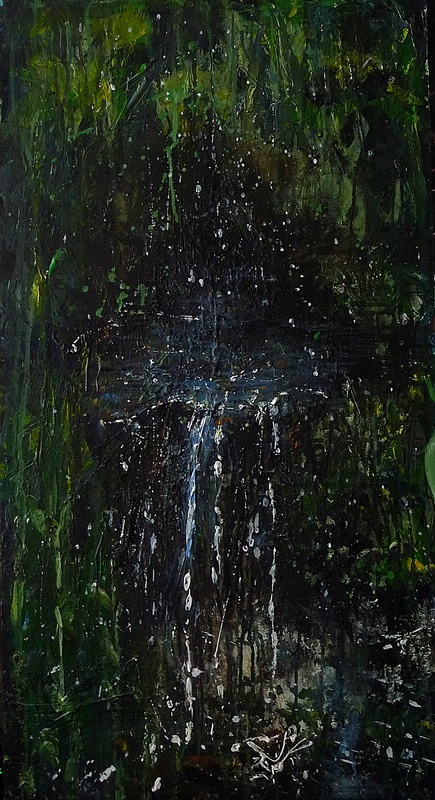 The paintings focus on the flora and fauna of the hill in the vivid greens of early summer, but in particular, water. This is rainy Scotland, so water is constant – everywhere on Arthur’s Seat – in springs that tumble down the hill, lochs that form in the valleys, and in its wells. Some of these wells have been named after saints – St David, St Margaret and St Anthony for example – so at some time in the past they were perceived as sacred. There are hints; in the worn stone basin and cup-chain attached to St Anthony’s Well, which ran dry in the 1980’s but used to seep through the cliffs below the summit, before emerging near the bottom of the hill and flowing towards St Margaret’s Loch. Just above the loch, on a rocky promontory you can see the medieval ruins of St Anthony’s Chapel – it was built in the 12th century, but the well and its stone basin were there long before. We know about these rituals because of written records from court cases that took place in the 17th and 18th centuries during the Protestant Reformation. For over a hundred years, people who were seen to ‘worship’ at wells might be prosecuted if their words and actions were seen as un-Christian. Yet, while these people may or may not have invoked the Christian god during their healing rituals, their actions showed reverence towards nature – a belief in its healing power and a complete faith that their prayers would be answered, if their well-being was part of nature’s plan. This was a pan-European belief – that nature held everything in balance, that disease or sickness, or bad crops, represented an imbalance of nature. Therefore healing rituals involved actions believed to restore balance, first by walking sunwise three times around the well (to create a boundary, or safe space) second by dipping a cloth in the well, applying it to the afflicted part of the body, then leaving it near the well, third by offering a token of gratitude such as flowers or a piece of metal ( this is the origin of ‘Clootie’ or rag-wells throughout the British Isles). If successful, the prayer would be heard, the disease absorbed into the earth, water or sky and the token accepted. 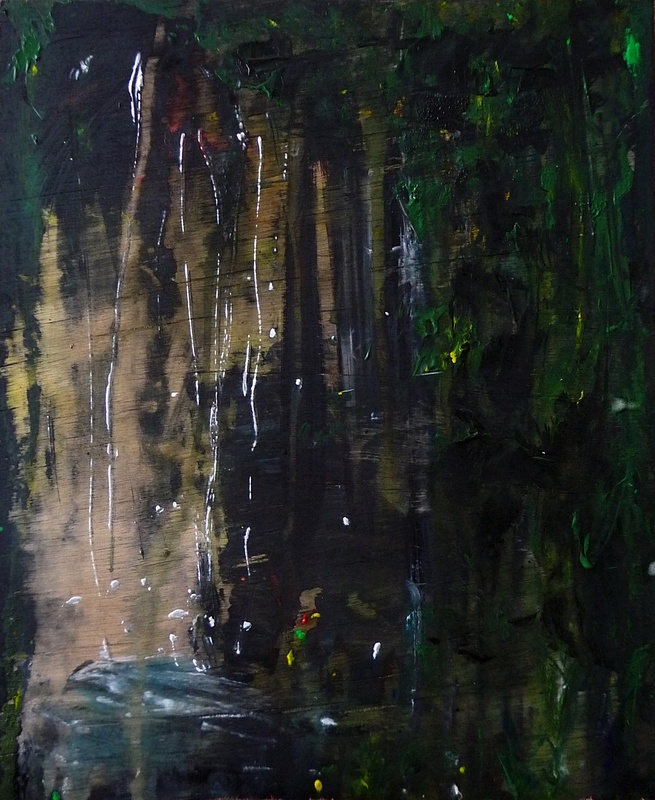 Water was seen as a ‘place of in-between’; these days we might say a liminal space (a place of transition – occupying a position at both sides of a threshold) or if religious we might describe it as a place where there is a ‘thin veil between heaven and earth’. It’s this last intriguing concept that so fascinated me, and inspired this series. 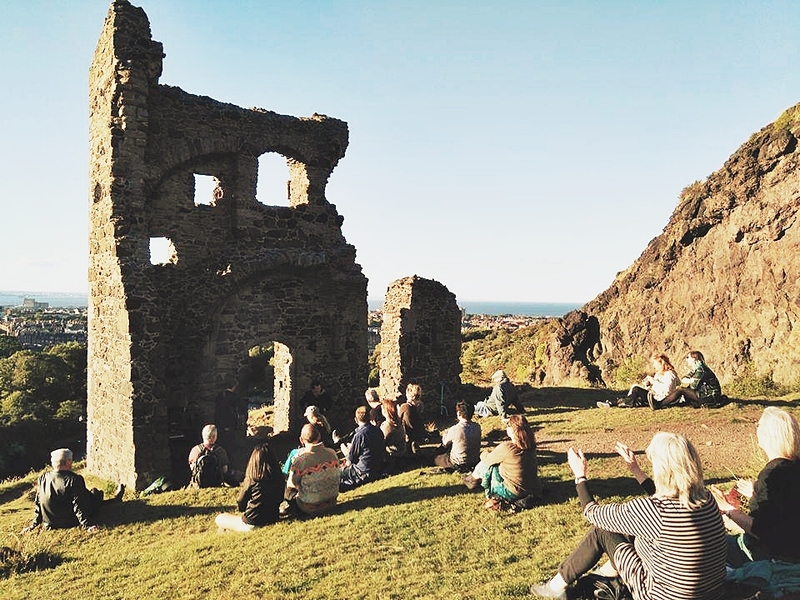 It made perfect sense therefore, to introduce these ideas about Arthur’s Seat to the poet Alan Spence, whose work is often created in response to nature and the changing seasons. For many years his work has explored the Japanese traditions of Zen meditation and Haiku poetry (in recognition of this he was recently awarded the Decoration of the Order of the Rising Sun by the Government of Japan). 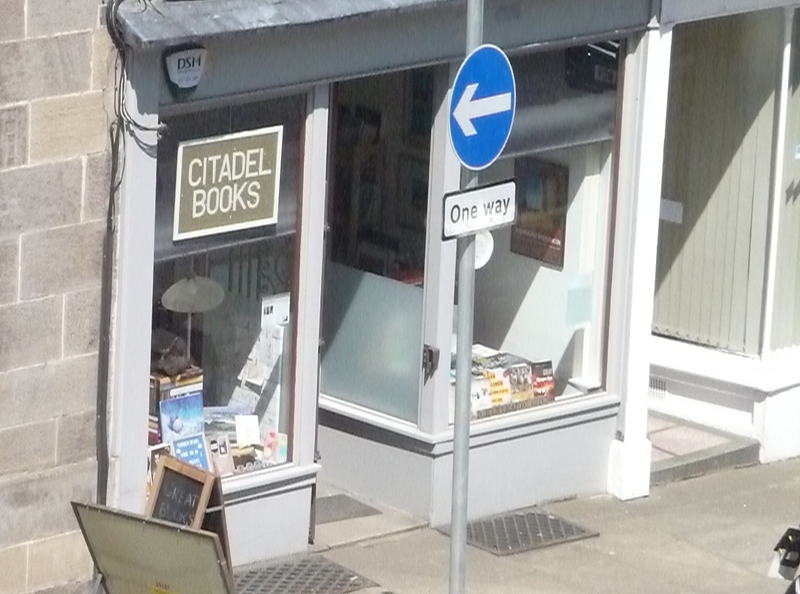 He and his wife formerly ran the Sri Chinmoy meditation centre in Edinburgh, and now run a bookshop and meditation centre The Citadel just across the road from my studio in Abbeyhill. The summit of Arthur’s Seat sits directly ahead from the front door of their bookshop (and from the window at the back of my studio). 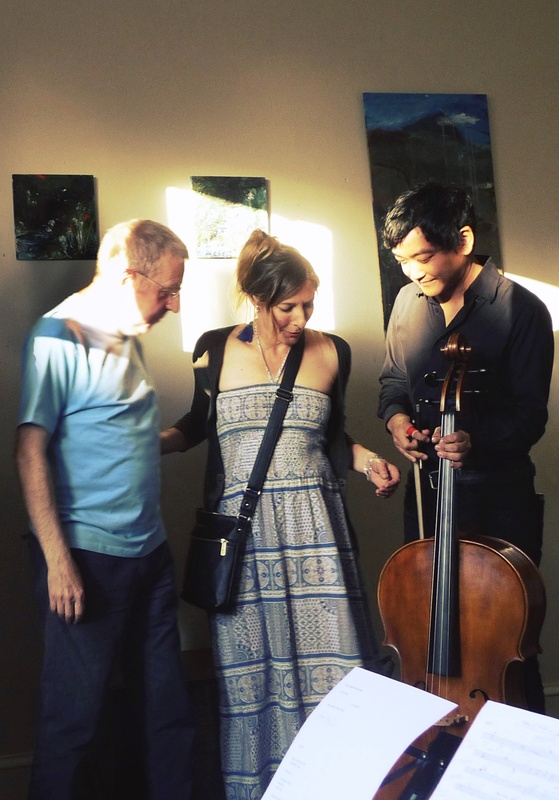 Alan was intrigued by the project, and was delighted too to collaborate with talented composer and cellist Atzi Muramatsu, a friend with whom I’ve collaborated since 2013 on most of my art projects. It was a given, of course, that I’d invite Atzi to collaborate, and of course his Japanese origins add to the aspects of Japanese culture explored in this project. 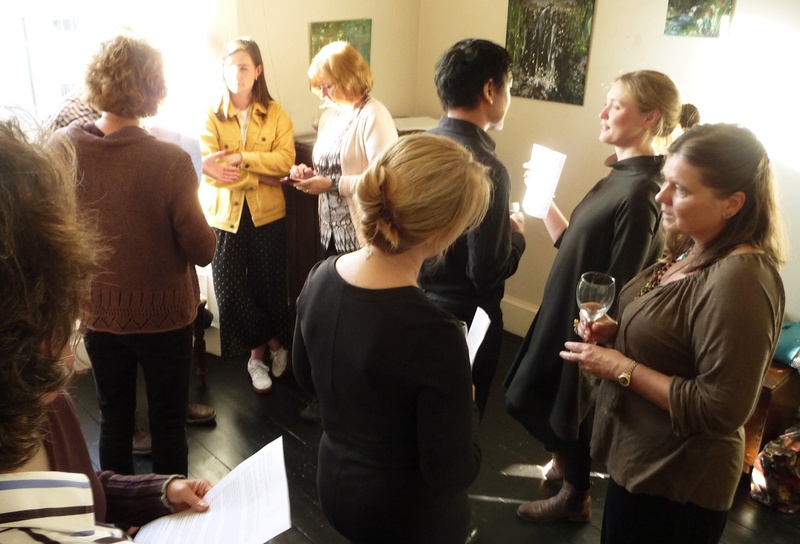 The creative fruits from this project – poetry, music and paintings – will launch at the Private View on the 16th June 2018 (this is invite only as spaces are limited, so please email if you would like to attend). 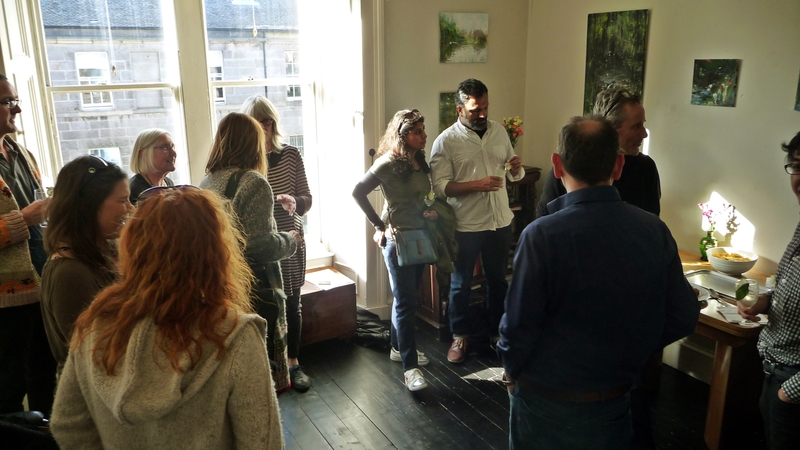 There are also Open Studio days (open to the public – all welcome!) 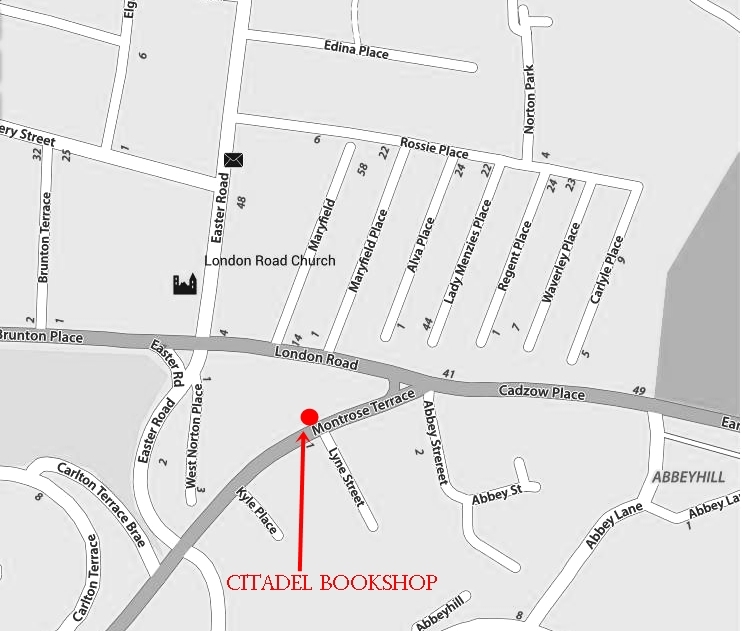 where the paintings will be on display, and a video showing Alan and Atzi’s performance from the 16th June. Note the sizes of the paintings, these are not always clear from images online, so to give an indication I’ve included the photo below .. 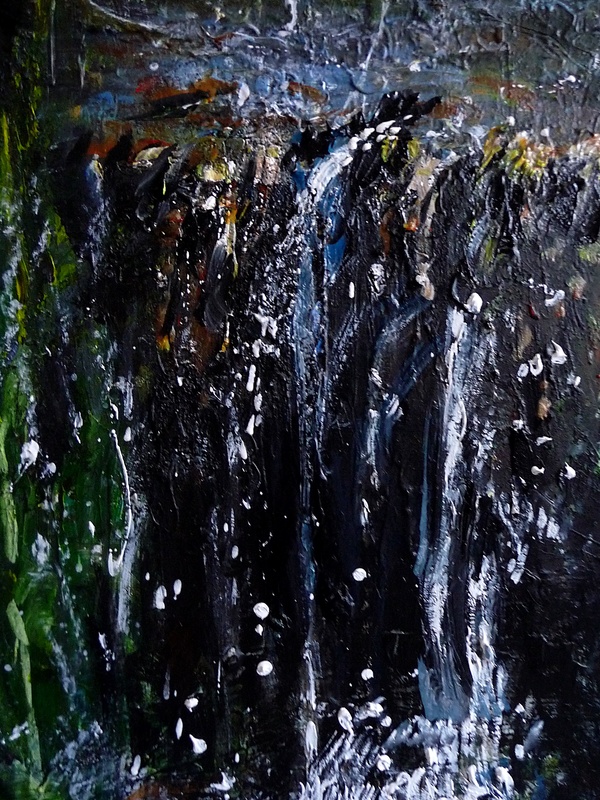 This entry was posted in Uncategorized and tagged Arthur's Seat, arts collaboration scotland, history of arthur's seat, paintings of water, scottish landscape artists, Scottish landscape painting on May 23, 2018 by rosestrang. The two directly above are still in progress, nearly there! This entry was posted in Uncategorized and tagged Arthur's Seat, paintings of Edinburgh, paintings of streams, scottish landscape painters, scottish landscape paintings, water paintings on May 22, 2018 by rosestrang.